If orange juice is orange and milk is milky, why is water transparent? That's the question posed by Dr Leonard Skynard of the University of Applied Wallpapering in Reykjavik and after five years of strenuous investigation he now has the answer. "Water is transparent so that fish can see where they are going," he told us. 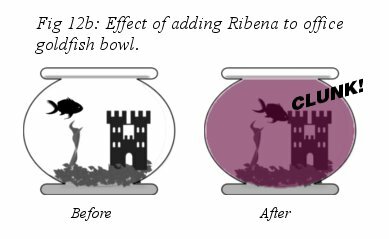 "This became apparent after we poured Ribena into our office fish tank and our goldfish kept bumping his nose on his little castle. As a side note I'd like to add that grass is probably green so that cows can see what they're eating, but a great deal more work needs to be done on this before we can be absolutely sure." We asked Dr Skynard if he had anything else to tell us about this amazing new insight. "Absolutely not," he replied.